Welcome to the blogging world! Watch out...it can be very addicting! Sorry about the DS (although my kids thought it was pretty funny)! I am so glad you started a blog. It is so addicting. You will love it!!! I love keeping up with everyone on the blogs. Email me your blogging email so I add you. I just made my blog private. 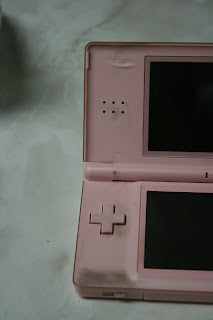 I am so sorry to hear about your DS. I love mine, and would be lost without it. I would probably be dumber, too. Because of practicing my brain age, I now have the brain of like a 40 year old, if I get better, maybe I will have the brain of a 20 year old. Maybe I will get the body of when I was 20, too! Don't ask me how I found you blog because I have no clue but I am glad I found you! Sucky business about your DS! Gotta love those kiddos or you would probably strangle them!!! Hope you don't mind that I drop by once in awhile!